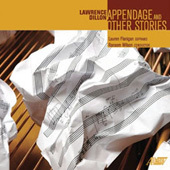 Appendage and Other Stories is a collection of works by Lawrence Dillon that combine words and music. Entrance and Exit use spoken text, Still Point is sung and Appendage alternates between spoken and sung text. Entrance and Exit are framing pieces for a chamber concert. Entrance is about layers of memory and connections to the past: a story unfolds about a listener whose mind wanders away from the music and drifts back to another time and place. Her recollections of that other world are influenced by the music she is hearing, and, in turn, the music responds to the journey of her imagination. Exit is an exuberant spin through an entire life cycle, foretelling the future as a metaphorical journey from birth to death and beyond. In both pieces, the text and music are held together through a complex system of cross-cueing between the actor and musicians. Still Point was commissioned by poet Shona Simpson to celebrate her husband Jonathan Burdette’s birthday. It scores Simpson’s tender sonnet for mezzo, viola and piano. The days rush by in fleets like drifts of clouds. but they are here before we know they’re not. till darkness forces them, like us, to rest. to stop? Like starlings, won’t alight, be seen? I seek the one still point in all the roiling air. I close my eyes, and you are there. Still Point was premiered on a concert series hosted in the Simpson-Burdette home. In late 1992, I became so discouraged with slow progress on a piece I was sketching that I crumpled up my notes, tossed them down to the end of the piano, and began working on something else. In the ensuing weeks, I found I couldn’t get the aborted sketch out of my head. I would frequently glance down to the end of the piano, where it lay in a disturbing heap, casting silent accusations of abandonment in my direction. Over time, it came to seem more and more like a living thing, and I found myself wondering how it would feel to be alive, yet unfinished — uncertain of ones identity, origin or purpose. That experience led me to a new piece, Appendage, about just such an unfinished creature, striving to complete itself, to make itself lovely. A song cycle in six consecutive sections, Appendage traces a fantastical journey from incoherence to a cautious self-awareness.